with its 4554 meters is the 6th highest Peak of the Alps. Monte Rosa is the Alps massif with most of the Highest Peaks of the Alps. You will be surrounded by Alps Giants. The Shelter/Lodge where you will sleep it is already in the middle of the glaciers and as soon as you will start the second day of climbing you will be in the middle of Ice. You will proceed with a headlamp in the night and when the sunrise will come you will understand why it is so glorious to hike in the Alps. 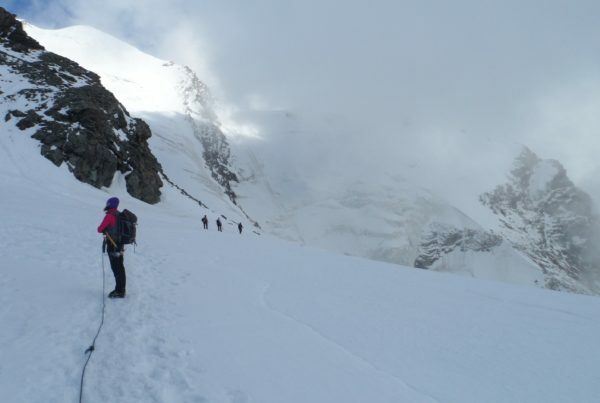 Summit Monte Rosa Peak is the perfect test for mountaineer beginners. You do not need any technical skill and it is a reasonably safe climb. 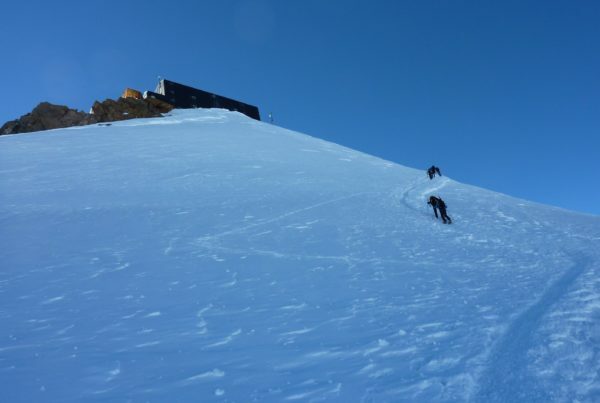 You will still need harness, crampons and rope. The crevasses you will see are among the biggest in the Alps. But the hike itself is pretty mild and good for beginners. Up the Gniffetti peak, there is Capanna Margherita, the highest shelter in Europe. 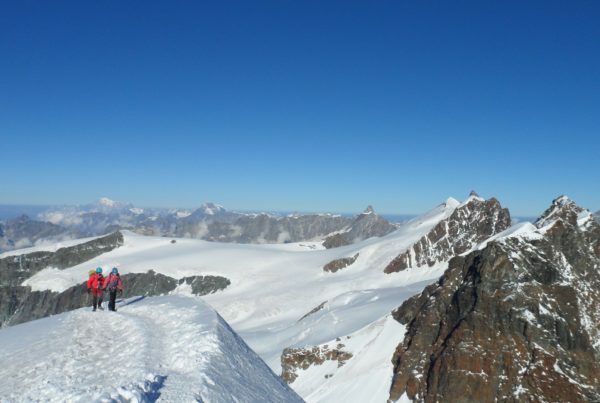 You can have a cup of Tea above 4500 meters after your Summit Monte Rosa Peak! From up there Lyskam Ridge is incredible and you will see all the Swiss Alps from above. 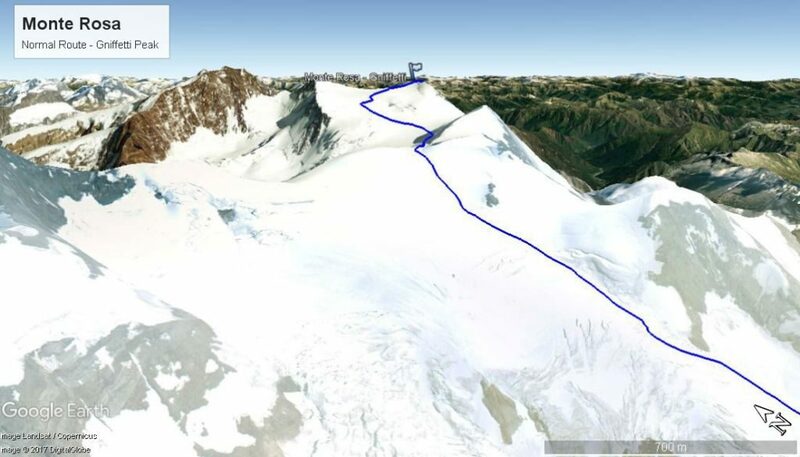 Here we describe the climb of the Summit of Monte Rosa to the Gniffetti Peak which is the easiest. If you are an expert mountaineer and you want to climb another route just contact us and we will provide you with several options. 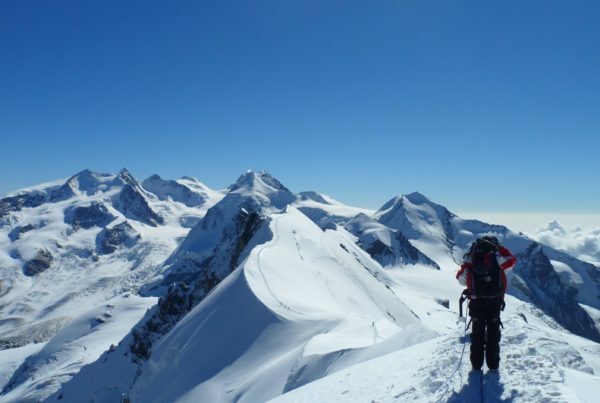 You can climb several peaks pretty easily such as Castore and Polluce from Ayas Valley but you can also make some difficult traverse such as the incredible Lyskamm Ridge or climb up the Doufur Summit Monte Rosa, the second Highest mountain after Mont Blanc in the Alps and the highest peak of Switzerland. 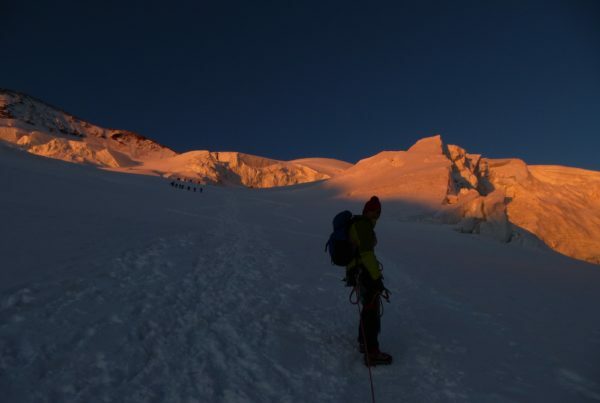 As for all the other 4000 meters peak you can ask Trekking Alps to prepare you in terms of altitude with a night in high mountain environment or to have a few days trekking before the Climb of Monte Rosa. 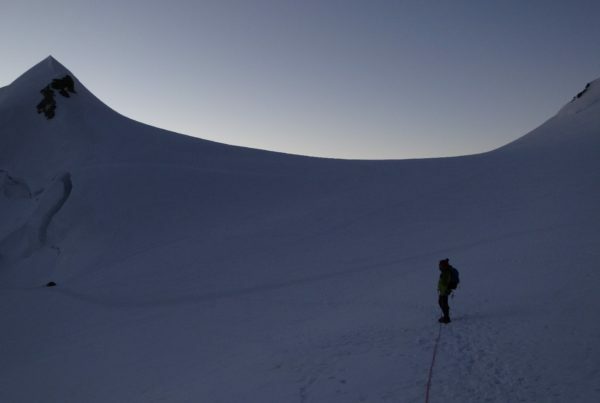 Usually, Trekking Alps propose a night at the top of Rocciamelone Peak at 3500 meters but also other options can be considered and suggested according to weather forecast and conditions.